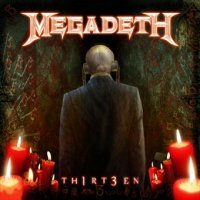 Megadeth is back with -- you guessed it! -- their thirteenth studio album and for a band with such a tumultuous history as Megadeth's the fact that they've lasted this long may come as quite a shock to some rock and metal fans. The curiously misspelled title - which for reviewers is irritating to type - is a way of celebrating the band's latest release which is something of a minor gem. This particular writer was a big fan of the band's last release but this time around bassist Dave Ellefson is back playing on his first Megadeth album since 2002's not-quite-so-good 'Rude Awakening'. Lyrically, Mustaine explores his demons and makes references to his past mistakes and his volatile personality. Those who have read his excellent memoir 'A Life In Metal' will know that Mustaine has certainly lived a colourful life. The production of the album is top-notch but like Metallica, Megadeth will probably never make anything as powerful as their first few releases. Having said that, 'Th1rt3en' is a fine effort and proof that this band is far from over. They have a lot more to say and what they do say is worth listening to for sure.